New Jersey residents who commute to New York may have to pay $US0.90 more per trip starting in 2020 under a new proposal by outgoing New Jersey Gov. Chris Christie. The fare increase would jump to $US1.70 in 2028 and $US2.20 in 2038. The new revenue would go toward a plan to build a new tunnel between New Jersey and New York and repair the Amtrak North River Tunnel. The projects would cut commute times and increase reliability. 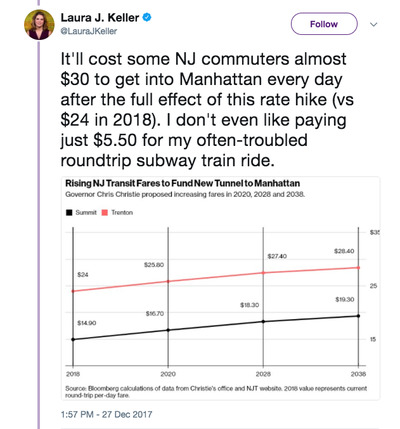 New Jersey residents who commute to New York will see their daily transportation expenses increase dramatically over the next two decades, according to a new plan proposed by outgoing New Jersey Gov. Chris Christie. The plan would raise New Jersey Transit rail fees by $US0.90 per trip starting in 2020, $US1.70 in 2028, and $US2.20 in 2038, according to a letter from Steven Santoro, the agency’s executive director. This would amount to daily cost increases of $US1.80, $US3.40, and $US4.40, respectively, for round-trip commuters. The cost increases would fund a new tunnel running under the Hudson River and repair the 107-year-old Amtrak North River Tunnel, which was damaged by Hurricane Sandy in 2012, according to a statement released by Christie. The projects would cut travel times and increase reliability between New Jersey and New York. 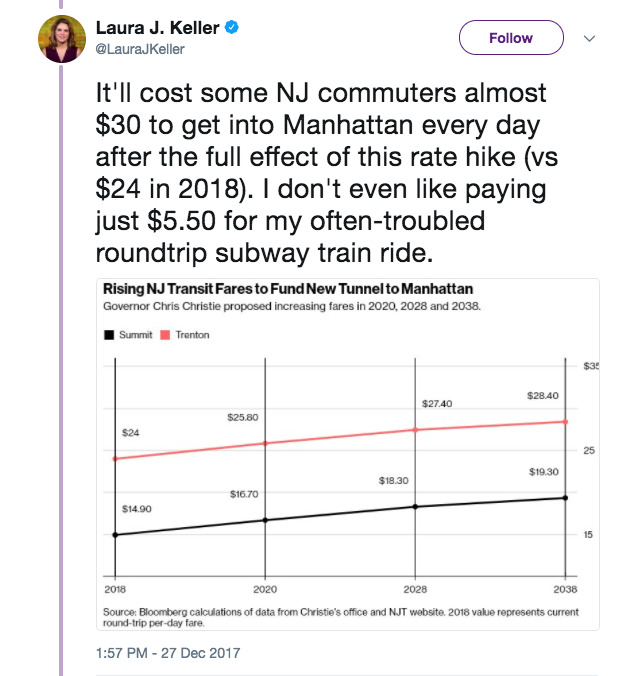 Christie cancelled an initial proposal for the new tunnel in 2010, as he feared that New Jersey taxpayers would have to pay for cost overruns. Bloomberg projected that some commuters would have to pay almost $US30 per day once the rate hike went into full effect in 2038. The current proposal is projected to cost $US12.7 billion and relies on federal funding to fill in the gaps left by the $US5.55 billion in combined funding pledged by the governments of New Jersey and New York. While the plan is currently under review at the US Department of Transportation, the new tunnel wouldn’t open until 2025 at the earliest if federal funding is approved, Bloomberg reported.